This recipe is a super original and delicious preparation, which provides a very different concept to the typical guacamole – because the pomegranate, the jicama and the mango make a big difference. In this guacamole you will find flavors that are sweet, spicy, crispy, tropical, earthy, fruity, juicy, etc . But that’s not all because you will also find endless textures and colors. All this is achieved thanks to the addition of so many ingredients. Like other guacamole varieties, this recipe can be used as snack in a special occasion or it can be used to surprise relatives and friends since we are sure that is a recipe that they have never seen before. 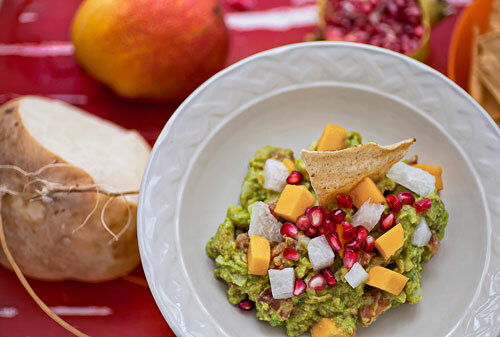 – The guacamole with pomegranate, jicama and mango can be accompanied with the traditional tortilla chips , with pita bread or even as an accompaniment of other appetizers , like some garlic shrimps or a delicious crab tostada. Just like the other guacamoles, this guacamole is not difficult to make... it only requires a little more time. To make this guacamole any type of mango that you find can be used. It is very important to use the lime juice in the guacamole so the avocado doesn’t oxidize. To buy an excellent jicama, just make sure that it doesn’t have soil and that its skin doesn’t have cracks. In 35 minutes your guacamole will be ready. It will yield 2 cups. Dice 1/4 of an onion and put it in a glass. Add in the glass, where the onion was put, the juice of 2 limes. Mix the glass ingredients with a fork. Leave the onion resting for about 30 minutes, until its flavor softens. This process is done so the onion’s flavor won’t steal protagonism to the other ingredients. Remove the seeds of 1/2 pomegranate and reserve them. Peel 1/2 jicama and 1 mango. Dice the jicama and the mango that were peeled; then set aside. Remove the seeds and the veins of 2 serrano peppers. Finely chop the 2 serrano peppers with the ones you worked and reserve. Scoop out the pulp of 4 avocados and put it in a bowl; reserve 1 avocado pit. Mash with the fork the avocados’ pulp that was put in the bowl, until having the consistency of a puree. The Pomegranate Seeds that were reserved. The Jicama dices that were cut. The Mango dices that were cut. Mix very well the bowl ingredients with a mixing spatula, then reserve. Verify that the onion that was left resting has a soft flavor; if not leave it resting for a longer time. Transfer from the glass to a strainer the onion that was dephlegmated and remove the excess of lime juice. Transfer from the strainer to the bowl the onion dices that were dephlegmated. Mix the guacamole with pomegranate, jicama and mango; with the mixing spatula. Insert in the guacamole with pomegranate, jicama and mango; the avocado pit that was reserved. The avocado pit serves to preserve the guacamole with pomegranate, jicama and mango for a longer time. Tip: If this guacamole is refrigerated, make sure to cover it with piece of food wrap film, which has to touch the guacamole so there is no air and in this way the avocado doesn’t oxidize. Variations: Don’t stop surprising your family and friends with other guacamole varieties like the banana pepper guacamole , the corn guacamole , the manzano pepper guacamole , etc. Did you like the Guacamole? Prepare this recipe in a silicone base bowl so it is firm and it doesn’t slip. This jicama is very juicy, it has very good flavor and it is crispy – perfect for this guacamole. These mangos are of very high quality as they are juicy, sweet and they have a divine color.